When we moved into our house, there were a few little things that we changed right away (e.g. paint, a washer and dryer from this century, etc), but otherwise things stayed pretty much the same. 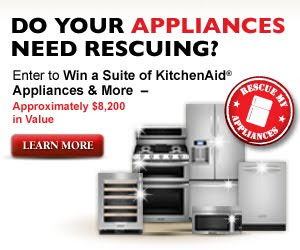 And now KitchenAid wants to make one lucky person's dreams come true with the KitchenAid Rescue My Appliances Sweepstakes! Don't miss this amazing opportunity to win a new suite of appliances (worth $7,000!) from KitchenAid, as well as Service Line Credits toward remodeling (worth $1,000) and a phone consultation with Susan Serra, a kitchen design expert (worth $200). From today through November 2, 2010, simply take a photo of your old kitchen appliances and then submit it to win! From November 3rd through the 17th the public will vote, so you'll be able to get all of your friends, family and readers (if you're a blogger) to vote for your submission. On top of that, each time someone casts their vote, they have a chance to win other great KitchenAid prizes - so everyone can be a winner! What are you waiting for? Head over and enter to win this incredible prize package from KitchenAid! The opportunity is very interesting. I'm glad you can participate in it! I would never win now. Our oven is very new actually and the fridge now looks new since we spray painted. Good luck to everyone who enters!